Which Cisco Access Point is the industry’s fastest and the most intelligent? 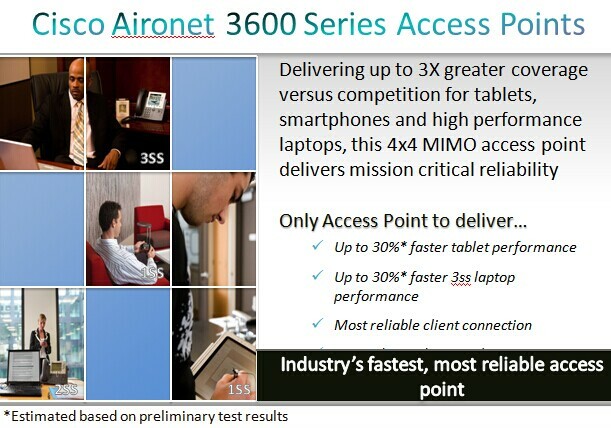 For example, get up to 30% faster performance for your tablets, smartphones, and high-performance laptops with the industry’s first 4×4 multiple-input multiple-output (MIMO), 3-spatial-stream access point. 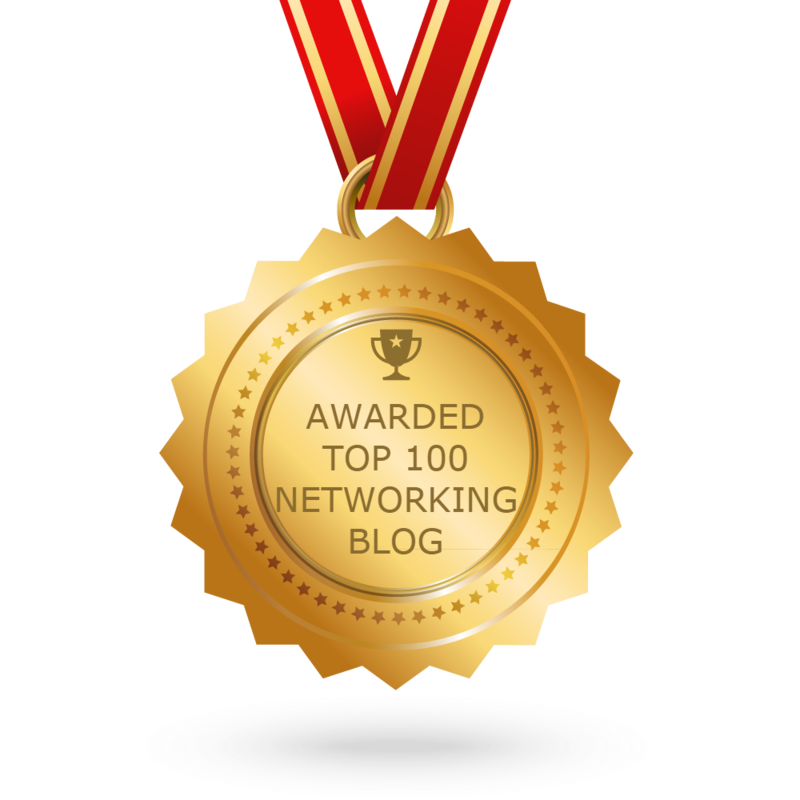 Who takes 802.11n Wi-Fi to the next level with a number of industry firsts? Yes, of course, it’s the Cisco Aironet 3600 Series AP. And now many organizations are facing a more fundamental challenge: Wi-Fi bandwidth constraints. The BYOD trend has resulted in an exponential increase in wireless traffic as mobile devices invade the enterprise. A wide range of wireless equipment—from medical devices to point-of-sale systems to sensors and building automation—also competes for wireless LAN (WLAN) bandwidth. The WLAN must provide the performance and reliability to deliver pervasive connectivity and support mission-critical applications. However, many WLANs were implemented as secondary, “nice-to-have” networks with limited coverage and functionality. These WLANs simply cannot support the ever-increasing demand for seamless access and a high-quality user experience. The 802.11n standard delivers at least 100Mbps of application-level bandwidth—comparable to the wired LAN technology used in most offices—with theoretical raw data speeds in excess of 500Mbps. It also uses more of the wireless spectrum, when available, to enhance performance, and is designed to resist radio frequency (RF) interference. But the heart of 802.11n is a technology called MIMO—short for multiple input, multiple output—that employs multiple antennas and radios to transmit and receive data. MIMO not only increases bandwidth but provides greater coverage, enabling high-speed connections over distances of 150 feet or more. The 802.11n standard allows for two-, three- and four-stream MIMO. The most common 802.11n access points (APs) come in a dual-stream implementation with two transmission antennas and two receiver antennas. 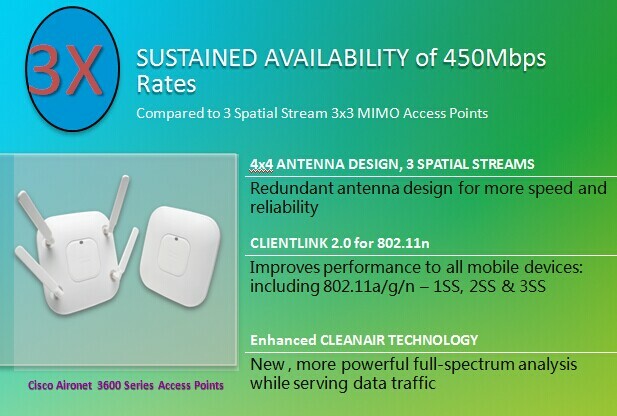 This so-called 2×2 mode allows manufacturers to specify maximum throughput rates of up to 300Mbps. True triple-stream MIMO supports throughput rates up to 450Mbps, delivering the capacity needed to serve a higher density of mobile devices. The Cisco Aironet 3600 Series AP includes Cisco’s ClientLink 2.0 technology, which can boost performance for 100 percent of client devices connected to the AP, regardless of the device’s wireless signal strength and spatial stream category. ClientLink 2.0 enables organizations to support a mixed environment of older 802.11a/g endpoints on the 802.11n WLAN. Cisco’s CleanAir technology helps ensure performance, increase reliability and deliver unprecedented RF spectrum troubleshooting, resulting in the best, highly secure experience. An optional RF monitoring module can provide full visibility into the complete Wi-Fi spectrum—all 23 channels rather than just the traffic-serving channel. By proactively and simultaneously scanning the entire Wi-Fi spectrum for interference and security threats, the monitoring module can intelligently and automatically choose the best channel to serve traffic, delivering the best user experience and fast, reliable performance. Cisco delivers investment protection with support for the new 802.11ac standard. The new 802.11ac Wave 1 Module for the Aironet 3600 Series AP supports speeds up to 1.3Gbps, giving customers the ability to migrate to 802.11ac without investing in a new appliance. Cisco continues to drive industry leadership and innovation by being the first to support standards-based fast roaming with 802.11r on the Cisco Aironet 3600 Series AP. Fast roaming can allow clients to move between access points without breaking a session, a critical requirement for many applications. The Cisco Aironet 3600 Series AP is supported by Cisco Prime Network Control System (NCS) and Cisco Identity Services Engine (ISE), creating a unique ability to address BYOD management and security challenges. Unified policy and access control in Cisco ISE and converged wired/wireless management in Cisco Prime NCS, together with the Cisco wireless LAN infrastructure, simplify and help secure the mobile experience.